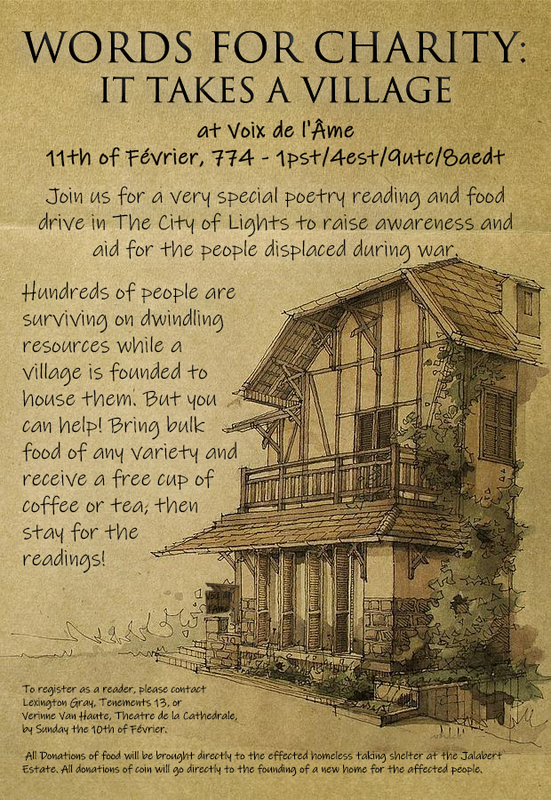 Join us for a very special poetry reading and food drive in The City of Lights to raise awareness and aid for the people displaced during war. Hundreds of people are surviving on dwindling resources while a village is founded to house them. But you can help! Bring bulk food of any variety and receive a free cup of coffee or tea, then stay for the readings! by Sunday the 10th of Février. All Donations of food will be brought directly to the effected homeless taking shelter at the Jalabert Estate. All donations of coin will go directly to the founding of a new home for the affected people. Countdown timer to the event! Click me to stay updated. // Delayed until a DM can restore the carvan master! //Save us, Obi-DM Kenobi! You're our only hope! // Round Two! ready to go! head on down.